Steve Mullins has earned a bachelor’s degree in American Folk Music, a master’s in musicology, and a doctorate in ethnomusicology from the University of Colorado. He has taught Latin America music, World Music, World Music Theories, and American Indian Music at CU. His doctoral dissertation is entitiled Flamenco Gestures: Musical Meaning in Motion . He also teaches World Music at the University of Wyoming. Steve has been featured in a cover story in World Rhythm Magazine. He has performed with a number of well-known flamenco artists including Chuscales, Marisol Moreno, Rene Heredia, Jeanette Trujillo, Lia Ochoa, Daniel Pelegrino, Mina Fajardo, Maria Vazquez, Meagan Chandler, Jesus Munoz, Kevin Romero, Juan del Valle, and Pablo Rodarte. He was a columnist for Mandolin Magazine during its entire run (1999-2015) with over 55 published articles. His compositions have been heard in settings as diverse as television commercials, documentaries, national public radio, silent movies, multi-media flamenco shows, and dancing horse performances at the National Western stock show. He has performed with his brother Brian throughout the Western United States for the “National School Assemblies” agency, and has also concertized in Germany, Switzerland, France, the Netherlands, Mexico, and Spain. He has performed with the Colorado Music Festival orchestra, the Boulder Philharmonic, the Longmont Symphony, Denver Brass, and the Boulder Mahler Festival Orchestra. He currently performs with Fiesta Colorado , Flamenco Denver ,the Barbelfish Balkan Band , Laughing Hands, Rim of the Well, Sandra Wong, and the Guitar Alliance with Alfredo Muro. 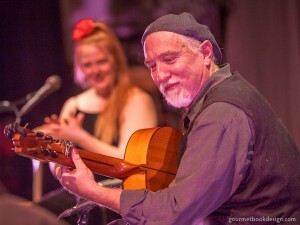 He has recorded 3 solo CDs along with CDs with The New Mandolin Quartet, Ojaleo, and Laughing Hands. He produced the Worldbeat Music and Dance Festival in Longmont (1999-2001) and has received a grant to compose and record music for “The Spanish Muse” multi-media flamenco show (including release of the CD Agua Y Sombra), and a commission to compose music commemorating the opening of Sandstone Park in Longmont. He composed a flamenco suite for orchestra (performed by the Longmont symphony in Nov. 2011), and a piece for marimba, violin, and piano, featured in the Pendulum New Music concert series at the University of Colorado in 2015. A CD of duets for banjola and mandolin (Shine and Rise) was released in 2011, and a CD of compositions for guitar, marimba, and violin with Rim of the Well was released in 2012. He teaches mandolin and flamenco guitar at the Olde Town Pickin Parlor in Arvada Colorado. He is also the author of the 1st ever banjola instruction book. A new CD of original music for guitar, violin, marimba, mandolin, and percussion, entitled Mosaics and Murmurations was released in March 2017.